Louangphabang (Lao: ຫລວງພະບາງ) or Luang Phabang (pronounced [lǔaŋ pʰa.bàːŋ]), commonly transliterated into Western languages from pre 1975 Lao spelling ຫຼວງພຣະບາງ (ຣ = silent r) as Luang Prabang, literally meaning: "Royal Buddha Image", is a city in north central Laos, consisting of 58 adjacent villages, of which 33 comprise the UNESCO Town Of Luang Prabang World Heritage Site. It was listed in 1995 for unique and "remarkably" well preserved architectural, religious and cultural heritage, a blend of the rural and urban developments over several centuries, including the French colonial influences during the 19th and 20th centuries. The centre of the city consists of four main roads and is located on a peninsula at the confluence of the Nam Khan and Mekong River. Luang Prabang is well known for its numerous Buddhist temples and monasteries. 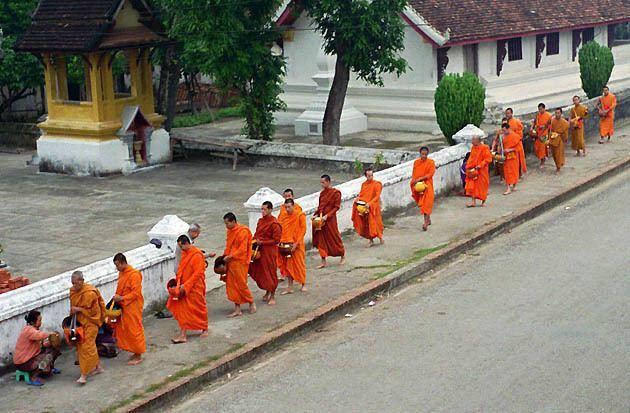 Every morning, hundreds of monks from the various monasteries walk through the streets collecting alms. One of the city's major landmarks is Mount Phou Si; a large steep hill which despite the constrained scale of the city, is 150 metres (490 ft) high; a steep staircase leads to Wat Chom Si shrine and an overlook of the city and the rivers. The city was formerly the capital of a kingdom of the same name. It had also been known by the ancient name of Chiang Thong. It was the royal capital and seat of government of the Kingdom of Laos, until the Pathet Lao takeover in 1975. The city is part of Luang Prabang District of Luang Prabang Province and is the capital and administrative centre of the province. It lies approximately 300 km (190 mi) north of the capital Vientiane. Currently, the population of the city as a whole is roughly 56,000 inhabitants with the UNESCO protected site being inhabited by around 24,000. Muang Sua was the old name of Luang Prabang following its conquest in 698 CE by a Tai prince, Khun Lo. Khun Lo had been awarded the town by his father, Khun Borom, who is associated with the Lao legend of the creation of the world, which the Lao share with the Shan and other peoples of the region. Khun Lo established a dynasty whose fifteen rulers reigned over an independent Muang Sua for nearly a century. In the second half of the 8th century, Nan-chao intervened frequently in the affairs of the principalities of the middle Mekong Valley, resulting in the occupation of Muang Sua in 709. Nan-chao princes or administrators replaced the aristocracy of Tai overlords. Dates of the occupation are not known, but it probably ended well before the northward expansion of the Khmer empire under Indravarman I (r. 877–89) and extended as far as the territories of Sipsong Panna on the upper Mekong. In the meantime, the Khmers founded an outpost at Xay Fong near Vientiane, and Champa expanded again in southern Laos, maintaining its presence on the banks of the Mekong until 1070. Chanthaphanit, the local ruler of Xay Fong, moved north to Muang Sua and was accepted peacefully as ruler after the departure of the Nan-chao administrators. Chanthaphanit and his son had long reigns, during which the town became known by the Tai name Xieng Dong Xieng Thong. The dynasty eventually became involved in the squabbles of a number of principalities. Khun Chuang, a warlike ruler who may have been a Kammu (alternate spellings include Khamu and Khmu) tribesman, extended his territory as a result of the warring of these principalities and ruled from 1128 to 1170. Khun Chuang, a single family ruled over a far-flung territory and reinstituted the Siamese administrative system of the 7th century. At some point, Theravada Buddhism was subsumed by Mahayana Buddhism. Xieng Dong Xieng Thong experienced a brief period of Khmer suzerainty under Jayavarman VII from 1185 to 1191. By 1180 the Sipsong Panna had regained their independence from the Khmers, however, and in 1238 an internal uprising in the Khmer outpost of Sukhothai expelled the Khmer overlords. Xieng Dong Xieng Thong in 1353 became the capital of the Lan Xang kingdom. In 1359 the Khmer king from Angkor gave the Phra Bang to his son-in-law, the first Lang Xang monarch Fa Ngum (1353-1373); to provide Buddhist legitimacy both to Fa Ngum's rule and by extension to the sovereignty of Laos and was used to spread Theravada Buddhism in the new kingdom. The capital name was changed to Luangphabang, where it was kept, named after the Buddha image. The capital was moved in 1560 by King Setthathirath I to Vientiane, which remains the capital today. In 1707, Lan Xang fell apart because of a dynastic struggle and Luang Prabang became the capital of the independent Kingdom of Luang Phrabang. When France annexed Laos, the French recognised Luang Prabang as the royal residence of Laos. Eventually, the ruler of Luang Prabang became synonymous with the figurehead of Laos. When Laos achieved independence, the king of Luang Prabang, Sisavang Vong, became the head of state of the Kingdom of Laos. The town was the scene of many events during and in the aftermath of World War II and it was occupied by several foreign countries during the war (Vichy France, Thailand, Imperial Japan, Free France, and Nationalist China). Initially the Vichy French controlled the city but lost it to Thai forces following the Franco-Thai War of 1940–1941. On 9 March 1945, a nationalist group declared Laos once more independent, with Luang Prabang as its capital but on 7 April 1945 two battalions of Japanese troops occupied the city. The Japanese attempted to force Sisavang Vong (the King of Luang Phrabang) to declare Laotian independence but on 8 April he instead simply declared an end to Laos' status as a French protectorate. The King then secretly sent Prince Kindavong to represent Laos to the Allied forces and Sisavang Vatthana as representative to the Japanese. Following Japan's surrender to the Allies, Free French forces were sent to reoccupy Laos and entered Luang Prabang on 25 August, at which time the King assured the French that Laos remained a French colonial protectorate. In September the Chinese Nationalist forces arrived to receive the surrender of the remaining Japanese forces but also quickly set about buying up the Laotian opium crop. In April and May 1946 the French attempted to recapture Laos by using paratroops to retake Vientiane and Luang Prabang and drive Phetsarath and the Lao Issara ministers out of Laos and into Thailand and Vietnam. During the First Indochina War the Viet Minh and Pathet Lao forces attempted to capture the city several times in 1953 and 1954 but were stopped before they could reach it by French forces. During the Laotian Civil War of the 1950s, 60s, and 70s, a secret American airbase was located at Luang Prabang and it was the scene of fighting. Luang Prabang remained the royal capital until 1975, when the Pathet Lao communist forces seized power with North Vietnamese support and dissolved the ancient monarchy. 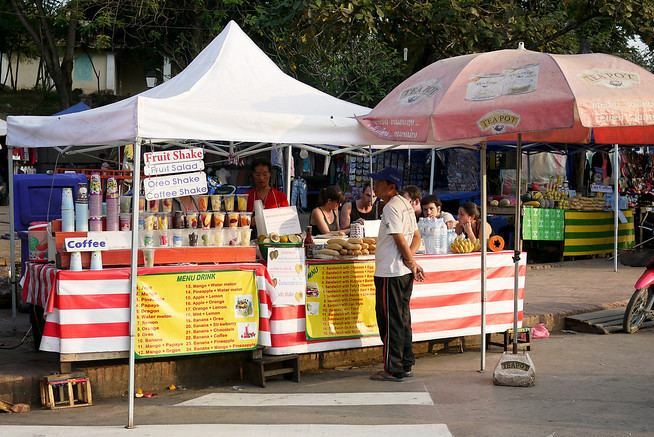 Luang Prabang has a rich artistic and culinary history and the city's cooks were hired by the king. Typical local dishes include: O-lam (Or lam, the favourite dish of Luang Prabang locals), Luang Prabang sausage, mokpa (steamed fish), and Mekong River moss (served fried) with its chilli sauce (cheo bong). Luang Prabang is served by Luang Prabang International Airport with non-stop flights to adjoining countries. Luang Prabang is linked by Route 13 with Vang Vieng and Vientiane, and by Route 1 with Muang Xay. Route 13 also connects the city to Cambodia. The road from Huay Xai to Luang Prabang is poorly maintained, remote, unlit, unmarked and dangerous for the unfamiliar, particularly in the wet season. Buses regularly travel the route in 14–16 hours. Route 13 from Vientiane, passing Vang Vieng, to Luang Prabang is paved, though the surface is in poor condition at places. It is also relatively narrow, with sharp curves. There are no markings or lighting on the road. Since 2014, a new road connects Kasi (close to Vang Vieng) to Luang Prabang, allowing the trip to be made in about 3 hours (compared to 5 hours via Route 13). Several daily buses run from Vientiane to Luang Prabang, taking 11–13 hours. The Mekong River itself is also an important transportation link. At Chiang Khong it is possible to hire a barge to cross the river. A trip from Huay Xai, across from Thailand, downstream to Luang Prabang takes two days by slow boat, typically with a stop at Pakbeng. If coming from Vietnam, sleeper buses can be caught from Hanoi to either Luang Prabang or Vang Vieng.